Sandy joined United from junior side Glenrothes, along with his twin brother Joe. 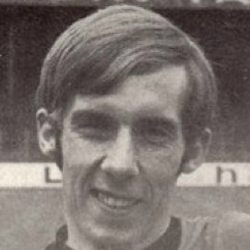 Sandy was a regular in the reserves before making the breakthrough into the first team in season 1972-73. He dropped out of contention again and back into the second eleven, and left United near the end of season 1974-75, joining Forfar Athletic. Sandy was born on this date in Ballingry. 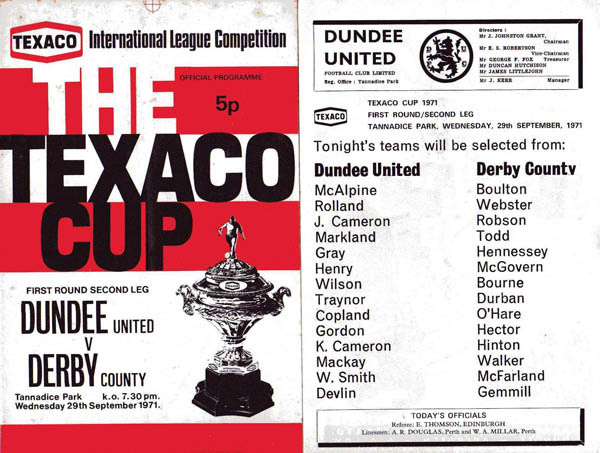 With a four goal deficit to overcome from their first leg, it was always going to be an unlikely task for United to advance to the next stage of the Texaco Cup against a strong Derby side. Nevertheless, the manager rang the changes once again following the defeat at Rugby Park in attempt to do so. Making his debut for United, one of the twin brothers from Ballingry, Sandy White, went straight into the starting eleven, along with Jackie Copland, Alan Devlin and Alec Reid. Shaking off any injury concerns following the weekend, Alan Gordon retained his place in attack. United dipped their toe in the transfer market on Thursday and brought Ian Mitchell back from Newcastle United, just fourteen months after his move from Tayside to Tyneside. Going the other way was Alec Reid, who had been at United since swapping Ibrox for Tannadice in 1968. Looking for an immediate bounce back from the 5-1 defeat to Rangers, Jerry Kerr named Mitchell in his starting eleven, in place of Reid. There were further changes, as Alan Gordon dropped to the bench for Sandy White and Doug Smith (having recovered from a broken toe) came back into the side filling the void left by Alan Devlin.